For over 50 years, the Comfort family tradition of fine, dry-aged steaks cut in-house has lived on. We invite you to join us for a wonderful dining experience. Our steaks and chops are prepared to order, and we also serve an array of seafood, pasta and chicken dishes in an elegant setting. Inside or outside seating is available for you to enjoy your next gathering. In addition to fine dining, we offer a fantastic lunch menu with daily specials. 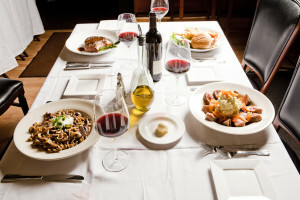 Jim’s Bistro offers the highest in quality menu along with an extensive wine list & full bar.